The Netbell-2-2Buz is a one-stop solution for factories, industrial facilities, commercial plants to build an automatic network timed alert system for signaling breaks, shift changes, and any other timed signal applications in areas of high ambient noise levels needed. 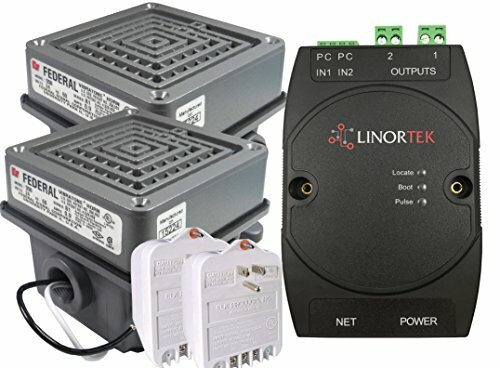 The kit includes one Netbell-2 networked Bell Controller, two 4-inch Federal Signal Horns, which produces100dBA @10' (volume adjustable, the second buzzer can be connected 150-200 feet away from the controller with 18AWG wire cable), two weatherproof back boxes for wall mounting and two 24VAC power supplies to power the horn, two 10-foot power cables. This kit is used for signaling in areas of high ambient noise levels. The Netbell-2 bell controller is housed in a Din-rail mountable enclosure with a built-in web server.With the Netbell-2, you can access, control and schedule your buzzer individually over a network or the Internet, no additional software or designated computer required. The built in web interface provides quick access to setup and manage your buzzers. It's ready to go out of the box, and you need only wire the buzzers with the Netbell-2 bell controller, and connect the bell controller to 12VDC power or POE and an existing network with the provided cable; it can be connected anywhere on the network, and does not require a direct connection to a PC. Scheduling and setup is accessed through any standard web browser. With the digital inputs you have the ability to wire an external switch for ringing bells manually. For those who wish to forego networking the Netbell-2, it is also able to function as a stand-alone device. Connecting the unit to a PC, upload the bell schedules, then remove, and it will function as scheduled. Whether stand-alone or networked, users can easily import/export their existing bell schedules using a simple text format. If you have any questions about this product by Linortek, contact us by completing and submitting the form below. If you are looking for a specif part number, please include it with your message.